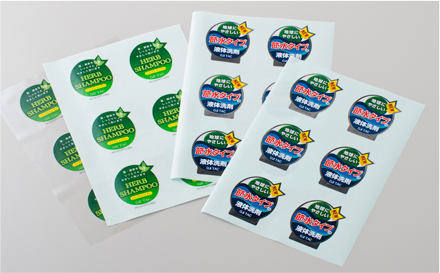 PP sticker | Self-adhesive film | Our Products | Oji Tac Co.,Ltd. A film made from biaxially oriented polypropylene with high transparency, gloss, chemical resistance and heat resistance, normally known as OPP film. Conventionally, OPP film has been limited to use as an overlaminate, as it could not provide superior print quality. However, we have succeeded in creating an easily printable layer on the surface of OPP film. This has led to the development of PP sticker with clear and silver gloss face stock, which can be printed on, and are moreover cheaper than PET film sticker. As well as excellent ink receptivity and anchoring , it also has good water resistance and adhesion to curved surfaces, and can be applied to a wide range of objects including drinks and detergent containers.